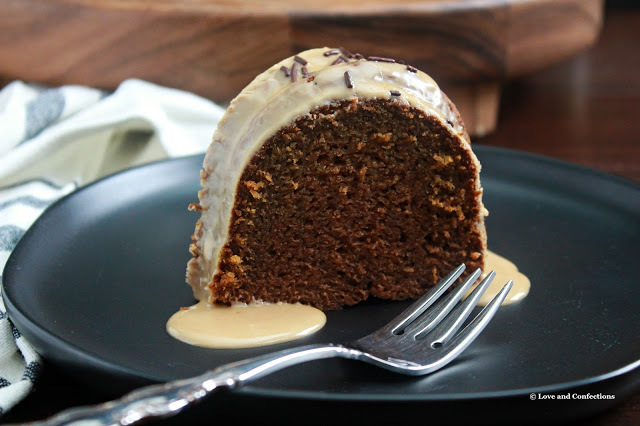 A family favorite, Kahlua Bundt Cake is a moist, rich, coffee-flavored cake that is easy to make and a definite crowd-pleaser. 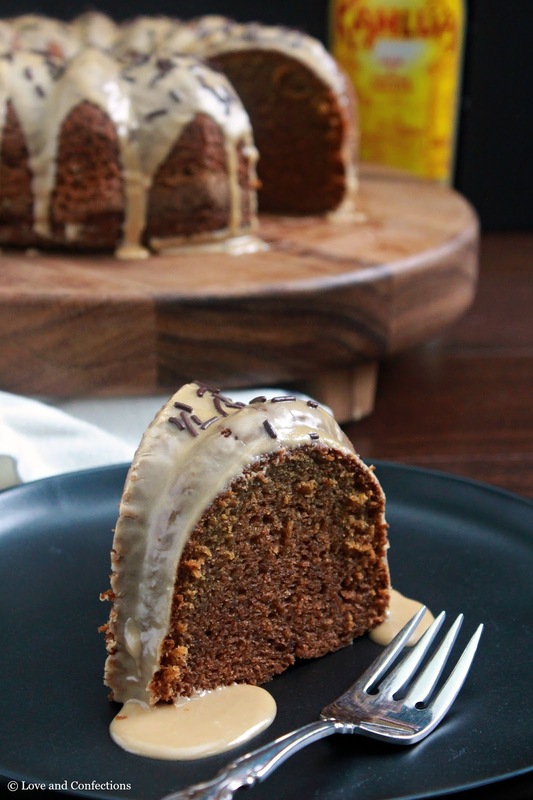 After a bit of a break, I am back and sharing one of my favorite bundt cakes with you. Little L&C had some minor surgery last week and I took some time off to take care of her. She is recovering well, aside from some problems at night, and I am ready to get back in the kitchen to bake. 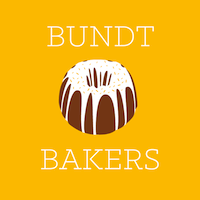 I am so excited that my first recipe of the new year is with the Bundt Bakers! This month’s theme is “favorite bundt cakes”. Kahlua Cake is at the top of my list for bundt cakes; right next to this Hummingbird Cake with Cream Cheese Glaze. I love anything coffee-flavored, and Kahlua is no exception. Now, I have to warn you. Most of what I bake is from scratch, but this is a family recipe that has been made for years and uses a cake mix as the base. Hopefully I will get to experiment and make a completely homemade version soon, but until then, you need to try this cake ASAP. 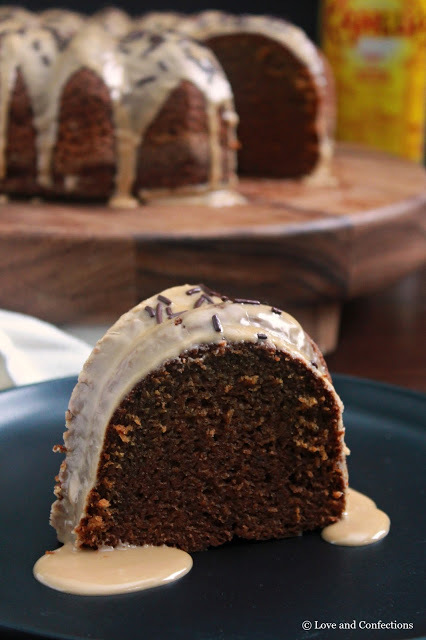 With a name like Kahlua Bundt Cake, you’d expect a lot of the liqueur and this recipe doesn’t disappoint. 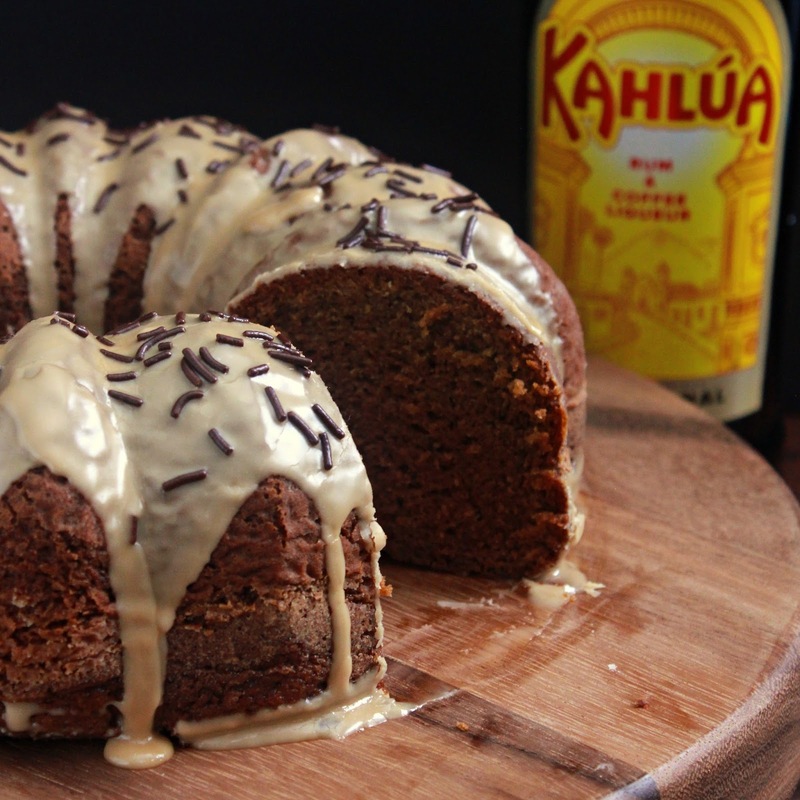 There is both Kahlua and vodka in the cake, as well as Kahlua in the glaze. I had to add some sort of decoration and opted for one of my favorite chocolate sprinkles. These sprinkles don’t taste bland or just sugary, they taste like actual chocolate. I know I have said “moist” probably too much in this post already – some people seriously hate the word – but there is no other way to describe this cake. Believe me, I looked at the thesaurus! Damp, humid, muggy, soggy, rainy, watery… and it only gets worse. If you know of a better word to describe this luscious and luxurious cake interior, then please let me know. 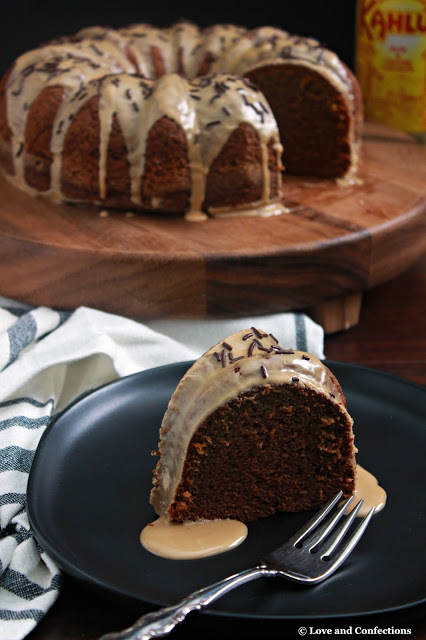 Kahlua Bundt Cake is seriously is sure to become one of your favorites too! What is your favorite bundt cake? Comment below – would love to know! Happy baking! Heat oven to 350F. Grease and flour bundt pan and set aside. In large bowl, combine cake mix, pudding powder, eggs and oil. Add in vodka, Kahlua, sugar and water and mix to combine. Pour into bundt pan and bake for 50-60 minutes, or until a toothpick or cake tester inserted into the middle of the bundt comes out clean. Let cool 5 minutes in pan then turn out onto cooling rack to cool completely. Place cake on serving dish. Combine powdered sugar and Kahlua to form glaze. Pour glaze over the cake and top with sprinkles. You had me at Kahlua. My cake this month started off with a mix as well….not a crime, especially when life requires extra snuggles with little L&C. So glad she is doing well. Omg. I love Kahlua. And I love bundt cakes. Perfecto combination. I’m going to make it this weekend. You can keep saying moist. I can see that it is moist! Yum. Your bundt sounds to be delicious!! Cake, Kahlua, and sprinkles??? What's not to like??? I love Kalua! I'm sure it's very good!